Easy Frugal Recipes: Marinated Grilled Veggies and Pasta Dinner - Feed 8 for just $0.86 Per serving! | Happy Deal - Happy Day! 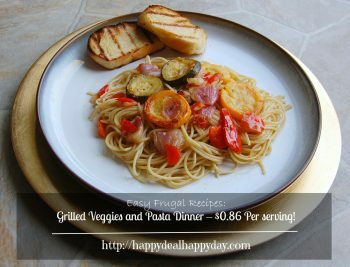 Easy Frugal Recipes: Marinated Grilled Veggies and Pasta Dinner – Feed 8 for just $0.86 Per serving! Here is a new Easy Frugal Recipe! 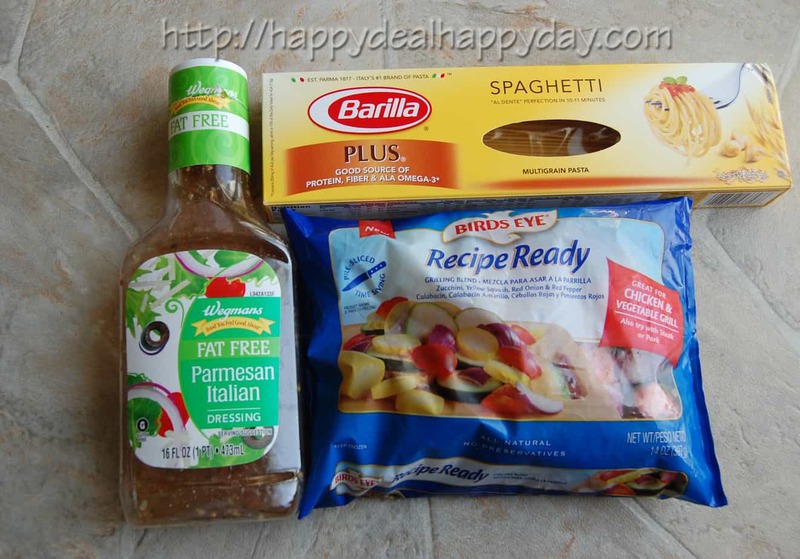 Grilled Veggies and Pasta Dinner – Feed 8 for just $0.86 Per serving! As I mentioned in a recent post, one of my goals this year for this blog is to share with you some how I prep meals based on the deals I get from the weekly Wegmans coupons and deals list. This one is more likely to be done in the summer since it involves the grill. But because of all of these polar vortexes, I was desperate for an actual outdoor grilled dinner! I begged and pleaded with my hubby to help me make this in the early part of February, and he agreed to help. He’s the grill master, so I needed his help – what a guy! The bread I have pictured above is actually a loaf of bread a friend of mine made for me, so I actually didn’t pay for it. =$6.87 for 8 servings – just $.86 per serving!!! I made this a vegetarian dish. You could of course add meat, and the cost would go up. But since this is so cheap already, it wouldn’t break the bank to add some shrimp, chicken or sausage to this dish! *Line your grill grate with aluminum foil and evenly spread out your 2 bags of Recipe Ready Grilled Vegetables Mix. Pour about 1/4 to 1/2 of the bottle of dressing over the veggies and let them simmer in that marinade. *While the veggies are grilling, go ahead and boil your water so that you can cook the box of angel hair Barilla Plus Pasta. *Grill the veggies for 15 – 20 minutes until tender. Turn them half way through. *Slice up your bread and add a thin layer of olive oil to each side of bread. Add that right to the grill grate and lightly toast each side. *Toss about a tablespoon or two of olive oil into the pasta after it is cooked and drained. Cover the pasta with the veggies and sprinkle with optional parmesan cheese. Served with grilled toasted italian bread on the side. Easy Frugal Recipes: Marinated Grilled Veggies and Pasta Dinner - Feed 8 for just $0.86 Per serving! Line your grill grate with aluminum foil and evenly spread out your 2 bags of Recipe Ready Grilled Vegetables Mix. Pour about ¼ to ½ of the bottle of dressing over the veggies and let them simmer in that marinade. Grill the veggies for 15 - 20 minutes until tender. Turn them half way through. While the veggies are grilling, boil your water and cook the box of angel hair Barilla Plus Pasta. Slice up your bread and add a thin layer of olive oil to each side of bread. Add that right to the grill grate and lightly toast each side. Toss about a tablespoon or two of olive oil into the pasta after it is cooked and drained. Cover the pasta with the veggies and sprinkle with optional parmesan cheese. Served with grilled toasted italian bread on the side. This one for sure is another frugal, easy and tasty dish! I wouldn’t have it any other way in my kitchen! 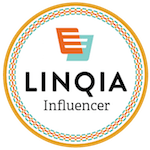 ← Big List of New Coupons – Direct Links! 2 Responses to Easy Frugal Recipes: Marinated Grilled Veggies and Pasta Dinner – Feed 8 for just $0.86 Per serving!